A Little Summer Painting | Tired, Need Sleep. Matthew has loved painting since he could sit upright in his highchair. I know painting with small children is stressful for some parents, but it is sooo much fun and, in my opinion, the benefits far outweigh the hassle of preparing and cleaning up. Summer time is the perfect time for letting toddlers paint. Just bring it outside! 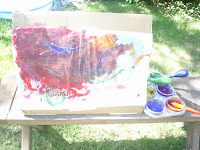 Fill a little wading pool nearby, use washable tempera paints, and you are good to go. Put them in their little swim diaper or swimsuit, give them a brush and a piece of paper and watch what they create. Set it up on a low bench or chair out in the grass, and use a large rock or two to hold it down by placing them inside the triangle. Use masking tape to attach a large piece of paper. We almost always use freezer paper as it is shiny on one side, which is great for fingerpainting, and matte on the other side, which is great for just about everything else. For the paint tray, I used a small 6-cup muffin tin. Originally I planned to just save the paint in it and add more as needed. However, this particular one started to rust (it was from the dollar store, so I'm not sure if that would happen with all of them, or those that are coated). So now we use small plastic tubs from individual size apple sauce and I attached them to the muffin cups with tacky putty - the kind you use to hang posters, etc. Cleaning them is super easy, though to be honest, we don't really clean them up very often. I just cover everything with aluminum foil and we bring them out whenever we want to paint. If the paint has thickened a little bit, just add a little water, or a little more paint and mix it up. It's easy for a toddler to use because the weight of the muffin pan keeps the paint stable while they dip the brushes in. Regular cups are easy to tip over, but we've used this for a few months now and haven't had a single spill! We have another one that we use for liquid watercolors, and it works just as well. 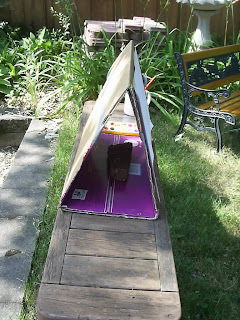 Yay for you, way to reuse that diaper box and make easel painting available in 15 minutes!